Demand attention and make a powerful statement with Kraft paper postcards. These thick 18PT postcards contain 30% recycled materials, making them an excellent choice for anyone looking for an environmentally friendly option. These recycled paper postcards provide a beautiful and rustic appearance creating a stunning look. Additionally, Kraft offers natural fibers and visible, subtle flecks which gives this paper stock a natural and organic appearance. 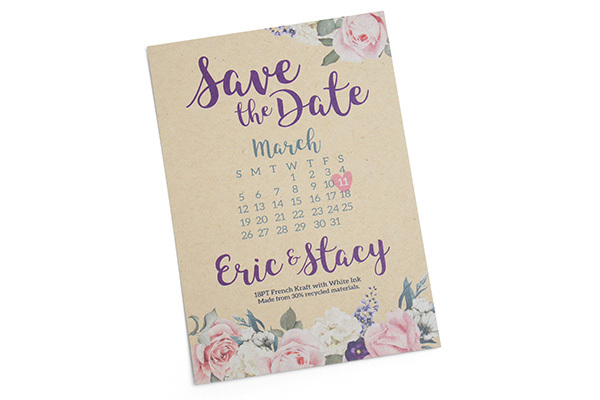 They are great for business marketing or personal use including wedding invitations, party announcements and so much more. Paper: 18PT Uncoated card stock provides a rustic, beautiful appearance. Contains 30% recycled materials. Kraft Printing: Printed digitally in full color CMYK for a truly organic look with the option of adding white ink masks for more opaque colors.